While thousands of scientists across the globe were busy pursuing things like renewable energy sources and cures for cancer, the good people at Sonic Foamer were hard at work on a far more important issue: how to make beer taste better. It’s a pretty crazy idea, right? I mean, beer is already pretty delicious as it is, and improving it seems tantamount to reinventing the wheel. But thankfully Sonic Foamer dared to dream, and through miracles of modern technology, they eventually devised a way to make it happen. The key to its magic is foam. That’s right, foam. You’ve probably been trained your whole life to avoid foamy beer, but unfortunately you’ve been duped. Ask any self-righteous beer snob and they’ll explain to you that a healthy layer of head is extremely important to the flavor of a beer. Your sense of smell is inextricably linked to your sense of taste, so the aroma (or “nose”) of a brew plays a huge role in how you perceive its flavor. Here’s how the device works. 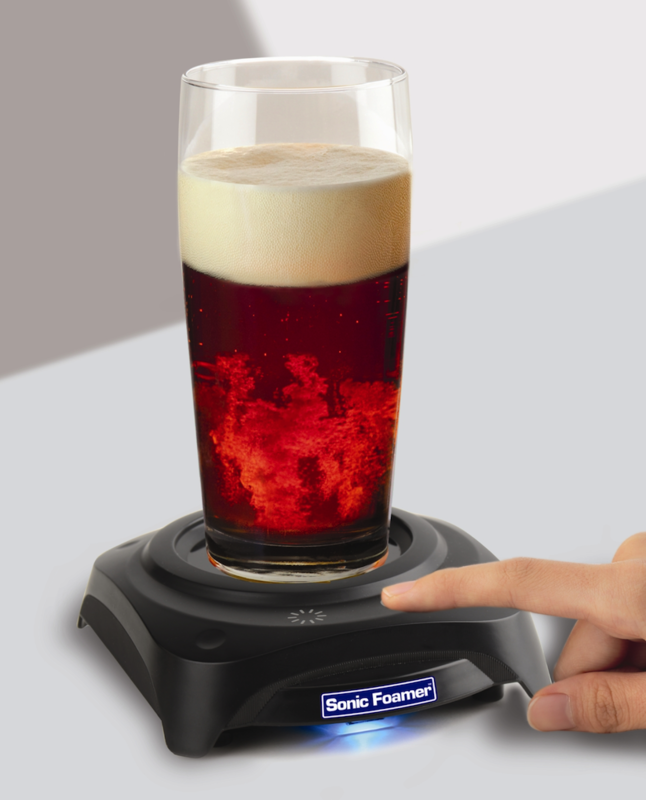 You start by putting a couple teaspoons of water on the Sonic Foamer plate, then placing your beer on top of it. This creates a seal between the plate and your glass, and ensures that the vibrations will be able to pass through. Then all you’ve got to do is press a button and Sonic Foamer will beam ultrasonic vibrations up through the bottom of your glass. This excites the gasses in your beer, birthing a thick head almost instantaneously. Amazingly, this gives your beer a substantial aroma boost without causing it to go flat. It’s a pretty clever idea, but should definitely be used with caution. Sonic Foamer should never be used with a glass that’s more than 70 percent full, otherwise you’d run the risk of overflowing and wasting precious beer. You can pick up one of these badboys for just $40 bucks on Sonic Foamer’s site. Find out more here.